I will be screen printing (with some professional assistance) the wallpaper in layers (2 in regular ink and the top layer in thermochromic ink) at the Pellafort Press in Brixton on the 19th and 20th of May. I have booked the studio for two whole days from 9am - 5pm to leave time for test prints, and any corrections, to achieve the highest quality outcome. I am printing it myself as opposed to sending it off to be printed as I want have a level of control that assures my design is perfectly laid and to experiment with the thermochromic ink as I am bringing this in from an external supplier. 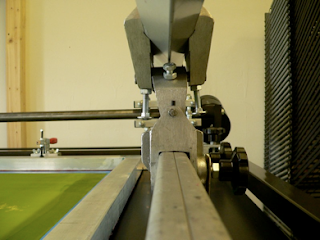 The aim is to screen print half a roll of wallpaper in order to provide enough for a panel as wide as 2 strips (approx 2 x 540mm) and reaches floor to ceiling (measurements to be confirmed), to simulate it in its intended state, with the sample book providing reference.